I recently heard an interview with an animal communicator on the topic of “Peaceful Transition for Pets and Families”. She made such a clear and truthful statement about euthanasia to the effect of: people find it very hard to determine when to end their pet’s life. When I heard that, I thought to myself, no wonder there is such a struggle. I can’t imagine contemplating that question. It is completely opposed to everything I believe as a human. Horses live in the present moment. They are masters. My goal is to be more like them. They don’t fret about the future and what might happen or not happen. When it actually arrives, then they deal with. Not before. That is how I kept my sanity during Maya’s 3 months of rehab. 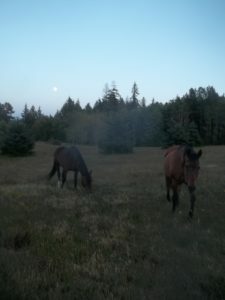 Of all the senior horses I had rehabbed I knew there was a real possibility that her life would end with euthanasia simply because of all the medical intervention and management going on. However, I did not focus on trying to determine when I should end her life, but rather, I focused on the many holistic treatment options we had. Physically there were big challenges going on, and yet, emotionally she had such a bond with my other horse, no way was I ever going to cut that short by ending her life. For three months on a daily basis we approached the present moment together. I’m not going lie. It became incredibly difficult. I cried often. At one point I handed it all over to God, I couldn’t do it on my own. Ironically the day after I did that the tide turned for the positive for about 2 weeks. Through all of this she was so content with her herd. Then the day came that dying was now in the present moment. I didn’t need to go looking for it. It approached all on its own. Since it was now in the present moment, I would deal with it. At the time, I had no more tools that I was aware of to help Maya and her pain level was very high. The only tool the vet had was euthanasia. I had always thought there would be a way to make the animal comfortable, or at least take the edge off, and then they could die on their own, but that was not the case here. That was my line, and we reached it. In that present moment, I had clarity that it was ok to euthanize her. Taking another being’s life still went against my values, so I began my research project on death, dying and pain management so my line for euthanasia could be even further away. I share all of this because we all have our own boundaries based on our own values and beliefs. There is clarity at the boundary, and as we learn more that boundary can move. One more time, I’d like to thank Maya. It was never my plan to be discussing this topic at such length, but that is where she has led me. For all of you with animals, let them lead the way. It is one incredible journey.